From left: EOP Faculty Mentor Program Coordinator Glenn Omatsu and Don Dorsey Excellence in Mentoring Award recipients — EOP Student Support Services Program Director Frank Muñiz, child and adolescent development professor Virginia Huynh, English and linguistics professor Sharon Klein, EOP Resilient Scholars Program Coordinator Jina Gonzalez, and Executive Director of the CSUN Mentoring to Overcome Struggles and Inspire Courage (MOSAIC) program Alex Ojeda. Photo by Thomas Macias. At California State University, Northridge’s Educational Opportunity Programs (EOP), mentoring comes with the job — literally. Every staff member, faculty and student who works there is given the title of “mentor”: The office manager is called the office manager mentor, the staff photographer is called the media arts mentor and the students are called peer mentors. Students can’t leave the program without having been mentored by several, if not dozens, of individuals — some of whom have been there for decades. 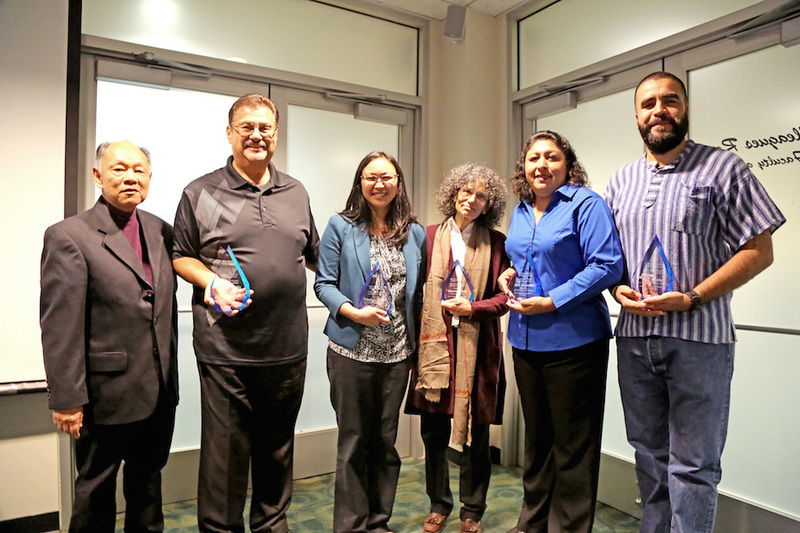 EOP celebrated this rich culture of mentoring by honoring five CSUN leaders at the 2016 Don Dorsey Excellence in Mentoring Awards ceremony on Nov. 16. The Don Dorsey awards were established in 1998 by the CSUN Faculty Mentor Program and EOP and are named after educational psychology and counseling professor Don Dorsey, who helped develop CSUN’s first mentor training program. The annual awards recognize faculty and staff who have made exceptional contributions to mentoring of past and current students. This includes a holistic approach to mentoring, including academic and personal support, as well as proactive involvement in the university’s commitment to the success of students from diverse backgrounds and communities. This year’s awardees are child and adolescent development professor Virginia Huynh, English and linguistics professor Sharon Klein, Director of EOP Student Support Services Program Frank Muñiz, Executive Director of the CSUN Mentoring to Overcome Struggles and Inspire Courage (MOSAIC) program Alex Ojeda, and Coordinator of EOP Resilient Scholars Program Jina Gonzalez. Each honoree was nominated by a student, staff or faculty member — and this year’s awards saw a record 27 nominations submitted for consideration. The five awardees exemplified the Faculty Mentoring Program’s three guiding principles — to make every moment a mentoring moment, or “mentoring on the run”; to build a community of mentors; and promote a culture of mentoring on campus. Becoming a part of a circle of mentoring and “paying it forward” was a theme that emerged throughout all of the awardees’ speeches. Each was introduced by those who submitted the nomination, and other peers or students familiar with the honorees. Professor Huynh was introduced by CSUN child and adolescent development professor Angie Guan. Hyunh is a daughter of Vietnamese refugees and shared her own difficulties as a first-generation college student, and the importance of mentors in her own life. After playing a video of Klein’s students expressing their gratitude for her support, the English and linguistics professor was introduced by her colleague, CSUN English professor Cheryl Spector. Klein thanked her students and the community of mentors for the award. Sociology and Chicana and Chicano studies double major David “Chino” Contreras introduced Ojeda, director of CSUN MOSAIC, which is a program that has sociology students mentoring at-risk youth who attend continuation high schools in the San Fernando Valley. Contreras is a student mentor in the program and talked about how Ojeda has served as a role model. Ojeda, an alumnus who earned his bachelor’s degree in liberal studies in 2009 and a master’s degree in Chicana and Chicano studies in 2013, said he was once an at-risk youth who was not expected to succeed. Ojeda said he was kicked out of three different high schools, was involved in gangs and was incarcerated as a teenager. His 10th grade guidance counselor told him that he did not need to go to college, Ojeda said. Later, after realizing he needed education, he enrolled in community college and discovered his passion for learning and teaching. He transferred to CSUN with two associate’s degrees at a 3.8 grade point average (GPA) and graduated with high GPAs for his two degrees from CSUN. Ojeda said mentoring is about community activism on behalf of his community. Muñiz, director of the EOP Student Support Services Program, was described as “one of the kindest and [most] giving people” at CSUN by Vanessa Morales, program advisor for the EOP/Trio Student Support Services Program. Muñiz received his bachelor’s degree in Chicana and Chicano studies at CSUN in 1980, and he has served as an advocate in EOP for four decades. In 1986, Muñiz helped developed a mentoring curriculum for a previous program called Student Affirmative Action, and his mentoring curriculum was used as a model to spread to other CSUs. Muñiz talked about his love for his students and what he has gained from interacting with them. Muñiz noted he was honored to share the award with EOP Resilient Scholars Program Coordinator Jina Gonzalez, who was his EOP mentee decades ago. Gonzalez, who earned her bachelor’s degree in Chicana and Chicano studies in 2007, received a special mentoring award in honor of the late EOP Director José Luis Vargas. Gonzalez was introduced by EOP Resilient Scholars Program Assistant Orlando Roybal. A former foster youth, Roybal thanked Gonzalez for supporting him in many different ways, from providing a listening ear and helping him succeed as a student to making sure he had access to health insurance and a doctor when he lost his MediCal coverage. Gonzalez, a daughter of immigrant farmworkers who enrolled as a freshman in the EOP Summer Bridge Program in 1986, thanked her students and expressed her joy about the award. Gonzalez — echoing the sentiment of the other speakers — gave special thanks to José Luis Vargas, who was the first person to receive the Don Dorsey award in 1999.